Today, we are releasing our Internet Security Report for Q2 2017. Each quarter, we analyze data from our Firebox UTM appliances deployed around the world in order to determine the latest computer and network security threats affecting small to midsize businesses (SMBs) and distributed enterprises. Additionally, in our latest report we analyze the WannaCry Ransomworm and discuss findings from our SSH and Telnet honeypots. 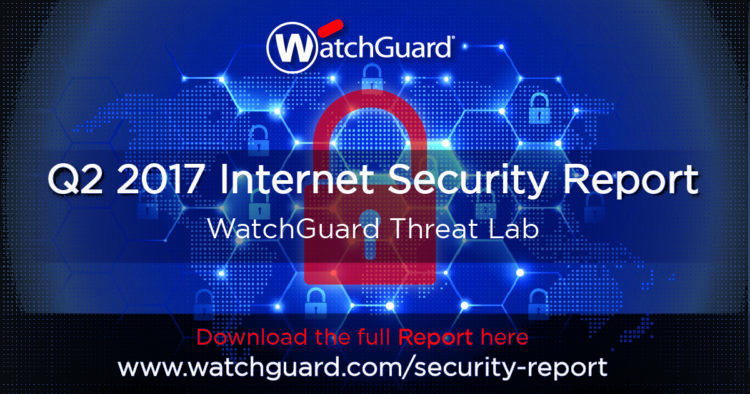 WatchGuard’s Internet Security Report uses anonymized Firebox Feed data from tens of thousands of active WatchGuard UTM appliances worldwide. In Q2 2017, these appliances blocked more than 11 million malware variants with WatchGuard’s Gateway AV solution, while WatchGuard’s APT Blocker caught an additional 5.4 million malware variants. Meanwhile, WatchGuard Fireboxes stopped nearly 3 million network attacks in Q2. To download the full 32 page report click here.